Transitioning careers can be scary. Okay, terrifying. When I—a liberal arts major—started teaching myself how to code, I fully expected that I wouldn’t be good at it. When I found out I enjoyed coding, I worried that I wouldn’t be able to get a job with it. When I got my first development job, I wondered if I would disappoint the people who hired me. And you know what? Sometimes I still worry. That’s because worry is a normal thing, especially when we’re faced with brand-new situations and challenges. It happens to everyone, and it’s nothing to be ashamed of. Being a newbie in the tech industry comes with its own unique set of anxieties. 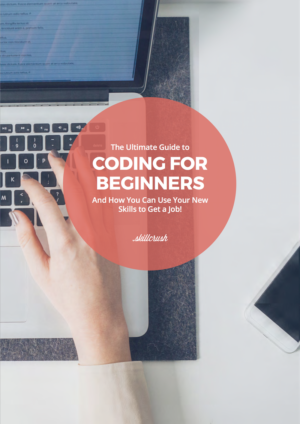 After talking with hundreds of beginners learning how to code, I discovered that there are a few key fears coders struggle with when they’re new in tech. Below I cover 13 specific fears, each relating to one of the above in one way or another. And show why you shouldn’t let them stop you from pursuing a tech career. 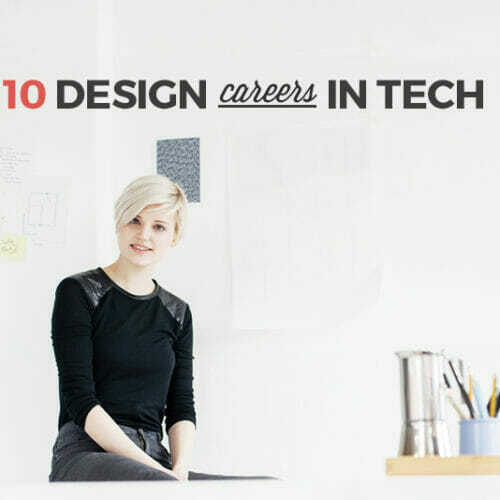 And if you are still struggling to see yourself in a tech career, you’re in the right place. In the free 10-day Skillcrush Coding Bootcamp, you can get a demystified introduction to the world of tech and write your first lines of HTML without (ever!) feeling like an imposter. Enroll in the course here! Yeah—not with that attitude! Here’s the deal: If you think you can’t, you won’t. A positive, “I can do it” kind of mindset is important when it comes to learning anything new, not just technical skills. This isn’t just a trite, feel-good mantra from a self-help book, either. CNN reports that positive thinking has been scientifically demonstrated to lead to greater success, productivity, and life satisfaction. Like with any skill, there are some people who are naturally gifted with computers. However, the reality is that most people don’t step into this world being a computer whiz. Just like learning a second language, it takes time and work. Sure, maybe you’ll have to work a little harder than the people who exit the womb typing 100wpm, but that certainly doesn’t mean you’re doomed to failure. Some people are naturally better at cooking, too, but follow enough recipes and eventually you’ll stop burning water. The key is being persistent, and finding an environment that helps you learn the best. Again, coding is an acquired skill, and doesn’t happen quickly for anyone. Most overnight success stories are actually years in the making. But even if you perceive yourself to be slower than others, you have to work with what you have. Don’t compare your journey to anyone else’s (except your past self’s!). And think about it this way: even if it takes you a year or two to start getting good, that time is going to pass either way. So you have two options: being a year older with an awesome new skill…or just being a year older. There’s this little (okay, actually big) thing called imposter syndrome. 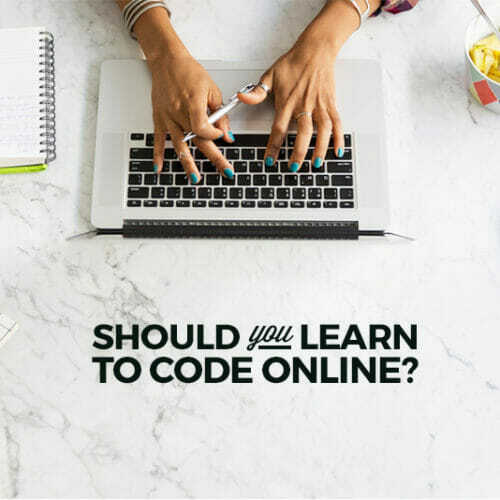 If you’ve been learning to code for even a short amount of time, you probably heard of it. It’s a syndrome that can be found in a range of industries and people groups. But did you know that the psychologists who first discovered this phenomenon were studying high-achieving women? Specifically, highly capable women who believed they were not in fact successful—whether those beliefs were caused by measuring themselves by societal expectations or putting unreasonable demands on themselves. Symptoms include feeling fake or phony—like you’re not “enough”—constantly downplaying your own success, not belonging, etc. 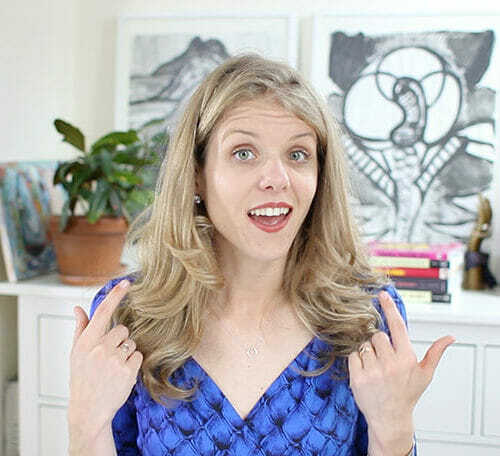 There’s lots you can do to overcome imposter syndrome—but you must start by acknowledging that it exists, and that, despite your inner thoughts, you DO belong. You might worry what others (like family and friends) will think of you for wanting to switch careers—especially if you have a decent job right now and are making ends meet. They might question it or think you’re just wasting their time. The truth is, I can relate to this feeling. Very much. When I first began teaching myself how to code, I didn’t tell many people. For years I had been talking about how I wanted to work in economic development (my original “dream career”). And after realizing it wasn’t for me, I felt ashamed. Like I was a flake. And to make matters worse, there were a few people I told early on who did question me! They told me I was making a mistake by pursuing coding, and to stick with what I was good at. Remember: if friends and family are trying to talk you out of it, it’s not necessarily because they want to hurt you. They want what’s best for you. But sometimes, they can’t see things the way you do. I get it: education in the US is expensive. You don’t want to take out more loans. And it’s not only expensive, but time-consuming, which makes it difficult to go back to school when you already have so many responsibilities. Gadgets and gizmos are expensive (but luckily, getting lower in price all the time!). But you certainly don’t need top-of-the-line equipment to get going. In fact, there are people who learn how to code on a mobile phone or tablet? Seriously—there are apps for that! Obviously, though, you’ll ideally want a laptop you can work from. It’s hard to be productive on a smartphone. And you will need the right software and tools so you can get experience with real-world coding. Solution: Lots of the premium software/tools, like Adobe, have monthly plans and payment plans, as well as special discounts/sales. You can also buy used laptops/gear on marketplaces like Amazon. Also keep in mind that there are free versions of lots of software. For instance—free text editors like Brackets, and free image editors like Canva and Gimp. Everyone wishes they had more hours in a day (I certainly do!). But the problem many people have is not a lack of time, but an issue taking control of their time. You have 24 hours in a day. Are you making the best of them all? Sure, you sleep for 7 or 8 hours every night. But that still leaves you with 16 hours left. Say you also work for 8 hours. That leaves you another 8 hours. What are you doing with them? There are tons of life hacks for getting more hours in the day. But the key is to remove the big time suckers we can all fall prey to. Stop watching so much Netflix. Limit time spent on social media. Stop saying “yes” to every favor or request that comes your way. Take a train or bus to work so you can use your commute time wisely—or listen to a podcast in the car. You can control your own time. And by carving out just a few hours every week to learn a new digital skill or take an online course, you can accomplish a lot. Feeling alone and isolated is very common when you’re learning new things on your own. I can completely relate. During my first year of learning how to code, I felt totally alone. You know what helped me stop feeling so isolated? Starting my Learn to Code With Me blog. Not only did blogging help me stay accountable as I taught myself, it also allowed me to connect with others also learning how to code, as well as more experienced people in the industry. Whatever it may be, you need to put yourself “out there,” in person and/or online. You’re not just going to meet like-minded people sitting on your sofa, pinning design inspiration samples to your Pinterest board! Tech positions can vary far and wide. Just because you know how to code or design a website doesn’t mean you have to sit at your computer all day typing till your hands cramp. When she first joined as an engineer, she was one of hundreds in her department. But she quickly rose above the rest. Now, she manages her peers. The company is even paying for her to get her MBA—something they don’t usually offer. The point is: having an outgoing personality in tech can be an advantage. You’ll stand out from the rest and could be prime management material. So many people believe that what they’re doing now is so different from tech that they can never make the switch. That’s not true at all. On my podcast, I recently interviewed Astrid Countee, who works as both a software engineer and an anthropologist. Talk about combining seemingly disparate industries! This is a person who started off studying psychology and has “reinvented” herself throughout the years numerous times. But as it turns out, rather than getting stuck after having to start from the bottom several times, Astrid is stronger than ever. Her diverse skillsets and her passion for learning make her marketable. “Passion mashing” is a term I like to use to refer to combining different passions into one. A great example of this (which I have used numerous times) is Skillcrush’s very own Director of Content Randle Browning. She uses her tech skills to fuel her blog about vegan cooking, The Waco Vegan. When you learn to code, it doesn’t mean you need to stop doing other things that you care about. In fact, it may make your passions for other things even stronger, because you can express and pursue them in a new way. If you put in the time and energy, build the projects, take the courses (and finish them! ), you’re going to get there. And people will take you seriously. 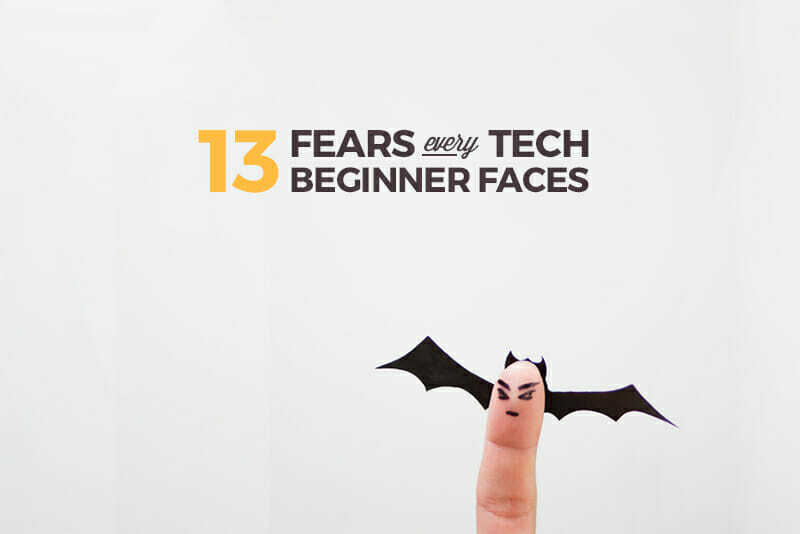 There are hundreds of fears a beginner can face when breaking into the tech industry; these only scratch the surface. If you’re a little nervous, realize that you’re not alone in feeling this way. But more than that, know that it’s okay to be uncomfortable. As the saying goes—all the good stuff happens outside your comfort zone. Don’t forget to enroll in the free 10-day Skillcrush Coding Bootcamp! You’ll get a jargon-free intro to common tech terms and concepts. Sign up here! Merely wanna remark on few general things, The website layout is perfect, the subject material is really good. “If a man does his best, what else is there” by George Smith Patton, Jr..
I’m too old. I don’t doubt I could learn. I taught myself stats for a degree a did a few years ago and got and A+, but am I too old at 50 and I’m a girl??????? Who hires a 50 year old female to code??????????????????????????????????? Siki: I always tell people to look at their dream job listings, and match their skill sets (and experience) to match that. So look up “dream job” postings, see what they are looking for, and curate yourself to match. Waterfallbooks: With anything (including writing) practice makes perfect! About hating it – I get what you’re saying. But the good news is there are plenty of jobs out there that involve tech skills…but don’t mean you have to sit all day at a desk coding. 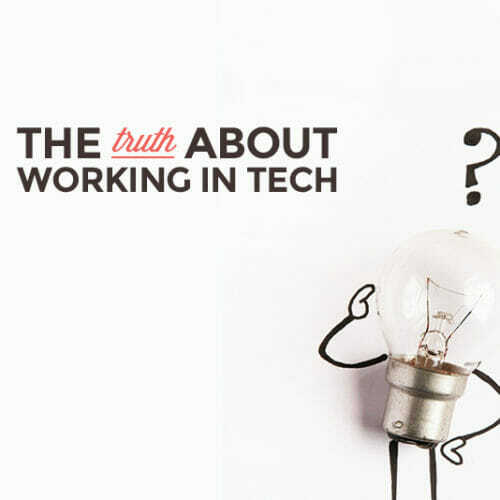 Actually – there are tons of jobs where you can combine coding AND writing. (Like a technical writer!) Either way, web design/development skills are wonder things to have. Great article. I am going to print out the list and display it on my work desk as a motivator. My fear is that I will never transition from my present unrelated career and find a front-end web developer freelance or permanent position. Current job applications with my online portfolio have resulted in rejections so I am fearful of missing the mark to qualify as a web developer. I love this!! This really hit me at the perfect time. I’m about to dive into a 9 wk coding bootcamp here in Miami and I’m TERRIFIED. So much self-doubt! It feels good to know it’s normal and I’m not alone in my fears. Thanks so much for posting this, you really have an uncanny knack for inspiration. Keep it coming. My two biggest fears about learning to code aren’t on this list! 1. Not being artsy enough for visual design and not being organized enough for behind-the-scenes code. I’m a writer – I’m good with words and I love stories. I’m pretty handy at learning new things and have great attention to detail. But I feel like images and code won’t use my natural strengths like writing will. 2. I will actually hate coding. I will invest all this time, effort, and money into learning a versatile new skill that will give me the freedom to travel that I want – and I will end up hating every hour I spend coding.